Creating mandalas in the sand is a way to explore the transitions in life. Andres Amador is an inspiring artist. His captivating images in the sand are energizing and calming all at once. He and his associate Kelsi Anderson now offer public workshops through Elemental Arts. I have attended two workshops and now have my own rake. I now can create my own art in the sand. 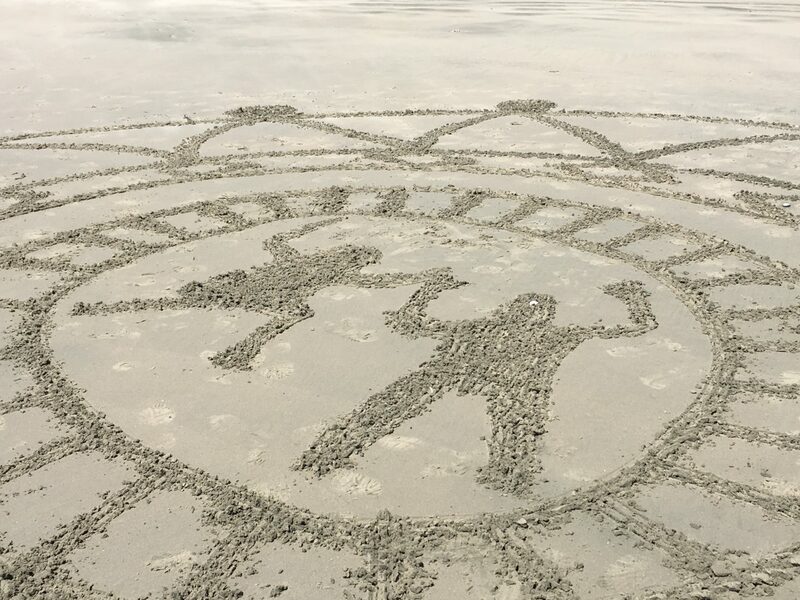 It is rather addictive to make mandalas on a low tide beach.The trick to creating the impermanent art pieces (low tide) is thinking about the whole while working on the parts. It’s also one of those rare exercises where you must, as Richard Rohr calls it, have a lightness of heart and a firmness of foot. Doodling or coloring mandalas is one form of meditative art. This, however, requires large scale imagination. It requires you to just let your heart lead you and then start stepping into the art and sand. You can’t worry about your footprints, you just have to walk intentionally and start drawing with your rake. A little foot shuffle erases your mistakes but for the most part when working large scale you really don’t get to see the whole until you are finished. I like to climb up on a few rocks to see how it is unfolding. A little bit of distance and elevation gives me a new perspective on where my heart and feet are taking me. Standing on a rock, I realized I was gaining a new perspective on the mandala but also my talents. In our world, we all must walk through transitions of career, life, and personal development. New job, new child, graduated child, new spouse, lost loved one…all transitions in life. I look for tools to help people reflect on those transitional moments and to see their talents with new perspectives. The sand manadala is a powerful tool for reflecting on your talents. Just start- take your rake and draw a big circle. Imagine what you want most of all… take the rake and think about space and the lines and the potential design. What is your heart calling you to spend more time doing?…what images speak to you: circles, diamonds, curves, boxes or straight lines? What is most important for others to know about you? …a trace of your shadow in a pose that celebrates you? Andres and Kelsi gave me the gift of learning how to create art in the sand. I know that together the three of us will continue to pass this remarkable tool on to others. For some, what Andres and Kelsi do is create art. For me, I see an amazing tool for being light of heart and firm of foot for transitional moments in life. Those moments are all about perspective and this work in the sand is a joyful way to gain new perspective. Let’s meet on a beach and create together! Together we can create and explore your transition as you walk with firmness of foot and lightness of heart on your favorite low tide beach.